I got a frantic call from my daughter: there is an enormous water gusher in the backyard. Warning: I have no particular expertise in this topic, beyond having dealt with exactly one leaking pipe semi-successfully, with learning by doing. Galvanized pipes are good for about fifty years. Mine are probably around sixty years old and in some places have an inch thick of rust surrounding them. Where the burst happened (which was a hole about .4 inches by .1 inch, plus a nearby pinhole, there was a full inch of corrosion, though the burst knocked a good chunk of it off. You can see the state of the pipe in the crosssection below. My first attempt was to wrap the leak with Fiber Fix. I cleaned off the pipe (though there was still some corrosion present) and wrapped it. This reduced the gusher to a drop per second -- a very good accomplishment -- but over time, the drip worsened to a trickle. I tried adding more Fiber Fix (and a similar epoxy tape product from the hardware store). Then I tried wrapping the Fiber Fix with Silicone tape. Silicone tape stopped the leak but quickly burst. So then I tried wrapping the leak with silicone tape and then wrapping the silicone tape with Fiber Fix. This again reduced the leak to a drop per second, which gradually worsened. Eventually I have a monster of tape and still have a leak. I think, if I had cleaned the pipe thoroughly, tape would have worked. Cleaning involves first knocking off the corrosion. 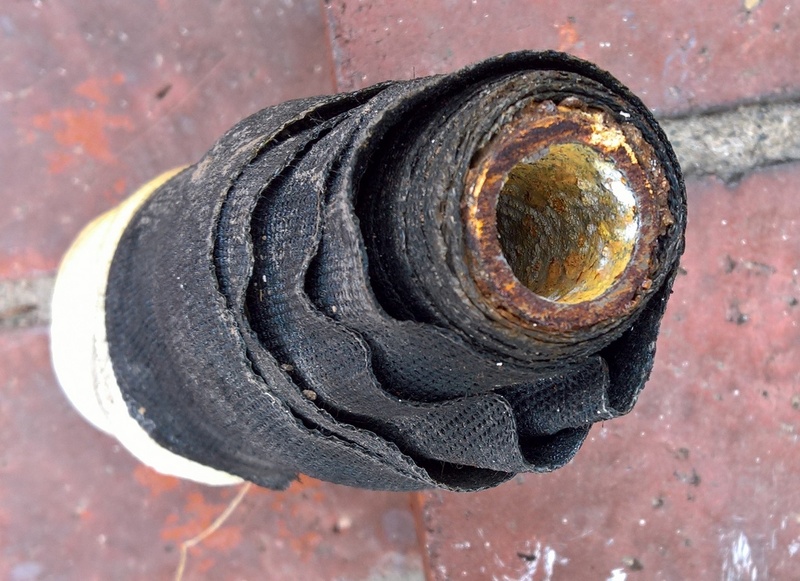 Using a large screwdriver and a hammer, aiming the screwdriver parallel to the pipe, I removed most of the corrosion. Then I used a rough file to remove the remaining elevated corrosion, mostly sliding the file with the pipe. Then I used coarse steel wool to clean up the remaining corrosion. This gets to a pretty smooth pipe. To use tape, I would recommend using first the silicone tape. This will create a good seal, better than I was able to do with the epoxy tape. However, the silicone tape stretches under pressure. To combat that I would then wrap the silicone tape in Fiber Fix or another epoxy tape. I am confident this procedure would work and create a semi-permanent fix. Of course, given that the pipes burst, the replacement of the pipes is coming due; this is only for a temporary fix. In the not too distant future, the pipes will have to be replaced. An alternative to tape is to cut a section of the pipe out and replace it with PVC. This is better if you have several holes or a long section with corrosion. You can cut the pipe with a hacksaw. This worked with no drips, but that was almost surely due to the fact that I cleaned the pipe much more thoroughly than I did with the tape. I even put a valve in my repair so that I can shut it off at that point. By the way, this is a way to test what is connected to what -- insert valves at various points so that you can shut off sections. It is pretty easy to do once you have done it once. When you do repair it, my recommendation is to frequently add valves. I couldn't shut off the water to the leak without shutting off all water to the yard. With the repair, I will be able to shut off water to different sections, basically every faucet. This document exists because it is what I wish I had found it before I dealt with the pipe.